Hi everyone! 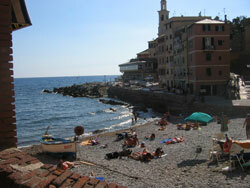 Daniela here, ready to share some tips about my hometown, Genoa! Maybe you’ve heard that Genoa was the birthplace of the Italian navigator and colonizer of the New World, Christopher Columbus. Or maybe about its Aquarium, the largest in Italy and amongst the largest in Europe. Are you a real boat and yacht enthusiast, or just want to experience something different this October? 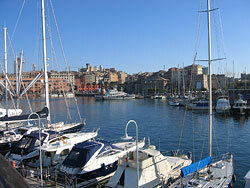 Then don’t waste a second and make sure you go to Genoa for the 53rd International Boat Show 2013. This year it takes place from 2nd to 6th October 2013! It is one of the world’s most important boat shows, dedicated to the pleasure craft market, taking place in the port of Genoa inside the huge exhibition area called Fiera di Genova. 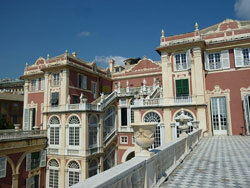 Genoa, the first thing to say about this city is that it’s just magic! I’m Elisa, I’ve studied in Genoa, worked there and I can tell that it’s one of those cities you never get tired of, since there’s always plenty of places to see, things to do and new friends to make! If you have the chance to go there, I’m going to suggest you the best places I know where you can enjoy some of the most beautiful sceneries of this charming city, the best little shops where all Genovese go and buy food as well, and also where you can go to enjoy the real night life, as if you were born in Genoa! I hope that, while reading this, you will feel like you are travelling virtually with me through the vicoli, you’ll taste with me the wonderful and incomparable focaccia and enjoy together its lively and amazing nightlife! And… here we are in Genoa! What about starting our tour in one of the little pedestrian streets in Genoa, it’s called Via San Vincenzo and it’s just some minutes walk from both the station and the main square in Genoa. Walking up this street, you can find two of the best focaccerie where you can taste our special, amazing and absolutely unique focaccia! You can also have a slice of pizza or farinata another speciality of Genovese cuisine.